Posted November 30, 2017 by Riley Hooper & filed under Arts & Entertainment, Comedy. 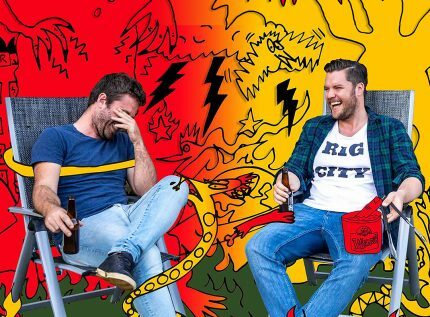 Frontier Comedy and The Brag are bringing funny pair and comedy podcast hosts Gus and Rig to the Oxford Art Factory for a first-time stage recording of their podcast, Sh!tshow. The boys will be hitting the stage on Sunday the 3rd and 10th of December for the live recordings. Gus and Rig had started their road to podcast glory by setting up a PA system and commentating games live for a lower grade Sydney Uni Aussie Rules team, in which they left playing to commentate. The two later launched their first podcast in 2016 with Medallica: Minnows vs The World. A podcast they ran during the Rio Olympics that focused on countries that had never won a medal. Their latest venture Sh!tshow is centred around a range of different stuff-ups and shenanigans from, weird cults, philandering politicians, stupid inventions and many other disasters. Since debuting the podcast in May, Sh!tshow has been signed by Seventh Street Media and has earned itself five-star ratings on Facebook and YouTube. Get in quick and join the boys for what is sure to be a hilarious stage recording of Sh!tshow.